Recently, Google has upgraded there algorithms by adding "Sitelinks Search Box" in Google Search Results. You might be thinking what it is right? Just look at the snap below, You'll get your answer ! So, as you can see the Sitelinks Search Box in Google Search result will let you search through the whole site from just one place. So, its a very nice update by Google. Well, Just type any company or brand name on Google Search and if that company or brand has upgraded there site accordingly, You'll get the "Sitelinks Search Box" in Google search results. 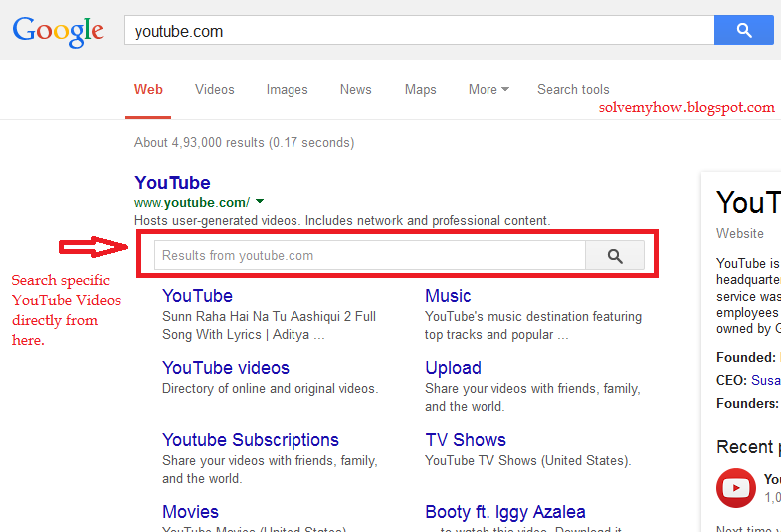 For Example :- In the above snap shot I searched about "YouTube.com" and I got the Sitelinks Search Box. So, from there I can search the whole YouTube videos. This functionality supports autocomplete too. Google also says using the perfect keyword or markup, The user will be redirected to the official webpage of the particular website. So, If you Implement the markup for your Site/Blog. The user will have the ability to jump directly from the Sitelinks Search Box to your site's search results page and if Google doesn't found any markup, Then they'll show the Google search results page for the corresponding site: query as they were doing till now. So, How to set up Sitelinks Search Box ? Step 1 :- Install a Working Search Engine on your site. You need a search box in your site. So, Sitelinks search queries sends the user directly to your site's search results page. 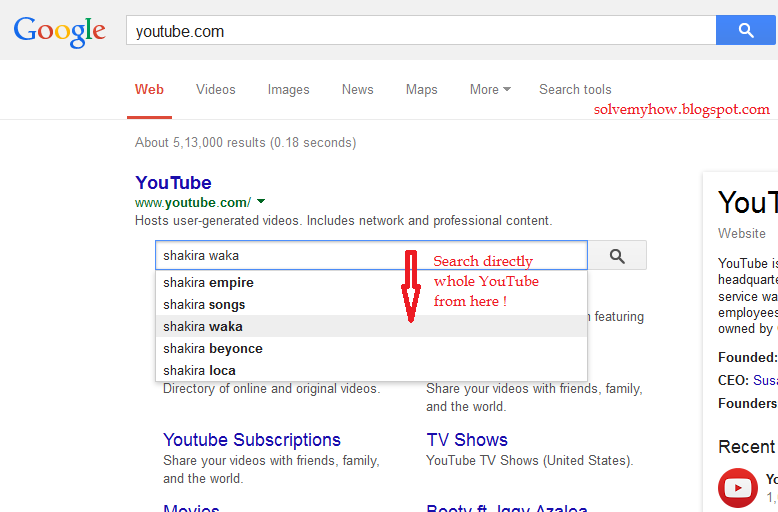 So, you must have a workable/functioning search engine to add this feature. You might have observed SolveMyHow. It has the workable search engine. Look at the snap shot below. Well if your site doesn't have Search Engine. You can set one up with the Google Custom Search Engine. Step 2 :- Set up Schema.org Code on your Site/blog's Template. Your markup must have all the elements shown in JSON-LD ! Impressed with your article but not satisfied ! You covered the topic quite nice.. But I would like to ask I have observed people profile being displayed in right side ?? Be Specific with your question. I didn't get you ! The Profile being displayed at the right side ? Actually its in your hand. You just go in Template >> Edit HTML and set it to Left, Top, Bottom anywhere you want and more over Sitelinks Search Box need the Custom Search Engine not our profile !